The Guardian in the UK reports, "Only a few hundreds protesters took to the streets of Pittsburgh to mark the opening day of the G20 summit of world leaders, but the police were taking no chances. But US security forces turned the piercing sound on their own citizens yesterday to widespread outrage. Pittsburgh officials told the New York Times that it was the first time "sound cannon" had been used publicly." As the anti-coup resistance approaches 90 consecutive days of civil disobedience the current illegal Honduran government has increased repression in the neighborhoods of the capital city, forcing the poor to fight or starve. The Obama administration continues to sit on the sidelines and watch (and in many ways encourage) the whole sordid affair. Something fishy is going on here in Brunswick, Maine. The corporation that is proposing to bring an Unmanned Flight Testing Center to the soon to be closed Naval Air Station in Brunswick is called Grifin LLC. As their headquarters, on a request for federal funding application, they give the address of 10 Mast Lane in Brunswick. The photo above is that address. Does not look much like your typical aerospace corporate HQ. One friend remarked that it appears as if Grifin LLC is fronting for some larger entity. We have shared this latest info from Wales with media around Maine. It will be interesting to see if any of them do anything with it. The Maine Aerospace Alliance (MAA) has just hired a guy with a background at Lockheed Martin to be their new Executive Director. The MAA has been instrumental in promoting the drone test center in Brunswick. determine the feasibility of creating an Unmanned Flight Center (UFC) in Brunswick." We will continue to do our best to bring it all out into the open so the public can have something to say about it before it is a done deal. We are being told by some local state politicians not to worry about this drone flight test center. But I've come to believe that these politicians are just trying to get us to give up and go away while they all work quietly behind the scenes to make it happen. Many in state and local government think that we have to take Pentagon money if we want local job creation because there is nothing else to replace it. 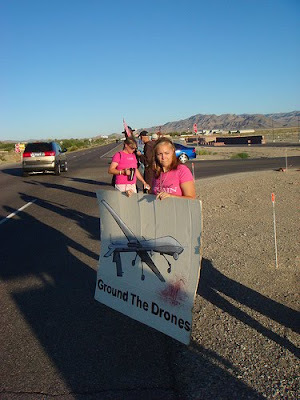 Better here than somewhere else one local official told one of our supporters just yesterday about the drones. This kind of "resignation" is what will in the end result in the further militarization of our economy and our culture unless we each unequivocally stand up against this. We will only get solar, wind, and public transit manufacturing, instead of more military production, if we fight for it now. Otherwise the momentum of the status quo will prevail. Author Woody Tasch clearly explains how current models of economic growth depend upon destructive and unsustainable living practices which do not support well being. We need new economic models and a new consciousness about what kind of spending, job creation, and production would be good for our economy and for the survivability of the future generations. In other words bold new thinking and the guts to publicly stand up for it. 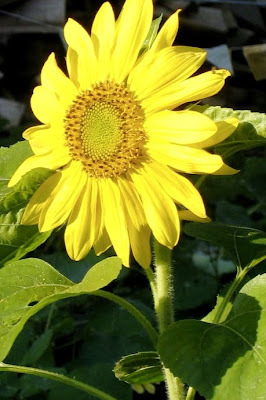 * Our garden is beginning to fade as fall approaches. The sunflowers are always majestic but the various kinds of squash are my favorite now after we had to pull up all of our tomatoes which were destroyed by the blight. * The drone story here has been top bill on the local newspaper twice this week. The letters are starting to flow into the newspaper. I sent one in this week and an activist in Kennebunk had a good one in the paper yesterday. This weekend is the famous Common Ground Fair here in Maine. It is one of my favorite annual events, a real celebration and display of the growing organic farming movement in the state. Several huge tents also house all the key social justice, environmental, and peace movement groups in Maine. We will take our little neighbor friend with us and go up on Saturday. I'll help out at the Veterans for Peace table and we will be talking up the drones issue while there. As people around the state learn more about the possibility of testing drones here in the Midcoast they are going to squawk. * Sarah Palin made her highly anticipated speech in Hong Kong yesterday and this morning I read a review of it by the great British journalist Robert Fisk. You can see it here There is no doubt that she will be running for president in 2012 and this is a warm-up trip for her so she can claim to have foreign policy experience. She concluded the speech with some slams on China and inferred that we need to "ramp up" military spending to protect America from the Reds........It's going to be a wild ride. Mike Papantonio gives a great historical perspective on the current racist right-wing surge to defend the health insurance corporate interests. While I don't share Papantonio's optimism about Obama, I think he is right-on with the rest of his piece. Worth watching. Papantonio has a show called Ring of Fire on Air America radio. Speaking of Mongolia, sandwiched between America's two biggest rivals, Navy Admiral Timothy Keating, Commander, US Pacific Command recently told the media, "They’re in, of course, a strategically critical spot for us, with Russia to the north and China in the south. They have some marvelous natural resources upon which they intend to capitalize. So they’re a good partner of ours, they’re good friends, and we enjoy working closely with them." Indeed the US is very interested in the resources that lie beneath the soil of Mongolia. They have the world's third largest deposits of uranium with virtually none of it currently being extracted. Coal and gold are also available in Mongolia and the multi-national mining industries are salivating at the chance to get at all of these deposits - and they want to keep competitors like Russia and China at arms length. 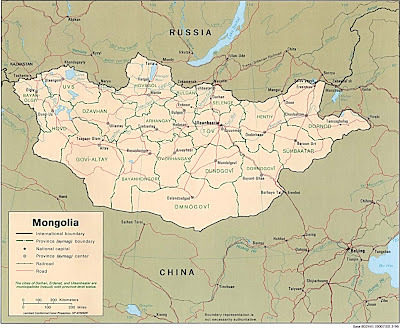 But even more important is the strategic value of Mongolia's location. It is the perfect military outpost for any nation trying to surround Russia and China as the US is today. Since 9-11 happened in 2001 the US has expanded its interaction with Mongolia. Military advisers now routinely make their way to Mongolia and the US is helping to finance and outfit new military bases there and is working to have unlimited access to them. In August of this year the sixth annual Khaan Quest 2009 multinational military exercises were held there, jointly run by the Mongolian Armed Forces and the US Pacific Command under the Global Peace Initiative program, at the Five Hills Training Camp, 60 km west of Ulaanbaatar. Over 700 military personnel from Mongolia, US, India, South Korea, and Cambodia took part in the war games. The Global Peace Initiative is a program managed by the U.S. Department of State to supposedly train "peace keeping troops" around the world. In truth this program recruits nations like Mongolia to have the Pentagon train their military forces for deployments in Iraq and Afghanistan and gives the US a "legitimate" excuse to set up military operations at bases inside their country. You can imagine that China and Russia are not thrilled to have the US military prowling around another country right on their border. Mongolia is just one more example of the current aggressive US plan to create more military outposts around the world - particularly in Central Asia. Be prepared next to hear that NATO wants to set up "global partnership" relationships with Mongolia. Swift Engineering is developing the Killer Bee unmanned aerial vehicle and produced this video animation of the UAV on a mission. This is the future of warfare.....cheap, "sanitized," and fewer casualties for the "good guys". 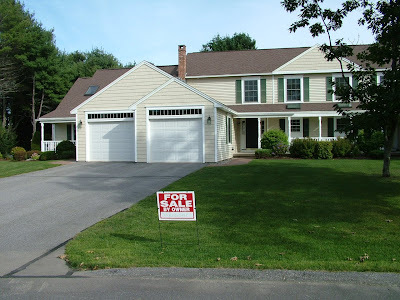 They need more testing areas for these systems and places like Brunswick, Maine are high on their list. The signs say "Release the political prisoners"
I hope you remember my previous posts about the six South Korean activists who were arrested last May under the oppressive "National Security Law". They were charged with the following crimes: Calling for the abolition of National Security Law, demanding withdrawal of the US troops, a peace treaty between the US and the North Korea, and reunification of North and South Korea. Three of the six have been released but the three in the photo above still remain in prison and are facing 3-5 year prison sentences. 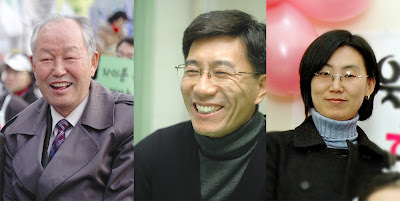 These three are from the Seoul office of the Pan-Korean Alliance for Reunification (PKAR) and are in the top leadership of the organization while the three who were recently released worked in PKAR offices in other parts of the country and were not at the top levels of leadership. Clearly the present right-wing South Korean government is acknowledging that they don't really have a strong case against the three they have released although they have been each put on several years of probation. I was recently asked by the lawyers for the three that remain in prison to send a letter commenting on their demands that US bases be closed and US troops be sent home. They wanted to show that this is a position that is held even in the US and I have gladly sent the letter. 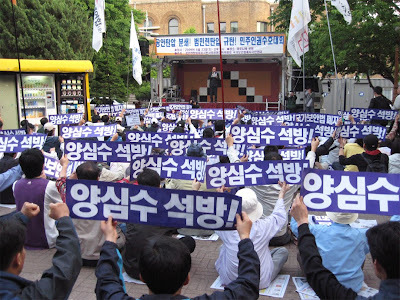 According to Korean Global Network board member Sung-Hee Choi, "The National Security Law was made by the right-wing in South Korea after the establishment of its own separate South Korean government , to purge their opposition. The precedence of the law was the ‘Law for Maintenance of the Public Security’ under the Japanese colonialism (1910~1945) that oppressed the independence movement activists who were against the Japanese imperialism. The ‘Law for Maintenance of the Public Security’ under Japanese imperialism was called ‘the most vicious law in the world’ and was abolished by the order of the headquarter of the united alliance countries after the defeat of the Japanese imperialism on October 15, 1945. More than 13,178 have been indicted under the National Security Law and went to trial from 1961-2002. The law has been used for the purpose to oppress the progressive movement who criticized the dictatorship governments." While recently in South Korea I visited Eun-A Choi (the woman in the above photo) at the prison where she is being held. She had facilitated the plenary panel I spoke on during our Global Network space organizing conference in Seoul last April. It is obvious to me that these trials of PKAR activists are meant to strike fear in the hearts and minds of the South Korean people by their right-wing government. And I have little doubt that the US, which also wants to suppress the anti-base and reunification movements in South Korea, is privately encouraging the government to pursue these policies. Similarly in the US we see the Obama administration refusing to shut down the Patriot Act which gives our government the power to suppress movements in this country that stand against its aggressive war making policies. We are getting reports from all over the world that aerospace corporations are selling drone testing to local communities and in every case are claiming that the drones will be for non-military purposes. These people are lying through their teeth and no one should believe a world of it. Tracking whales - come on......these UAV's are to kill people and to spy on us. We need to raise $1408.08 for a full page ad in the Brunswick Times Record opposing the testing of drones at the Brunswick Naval Air Station. We strongly oppose turning the Brunswick Naval Air Station into a base or a testing facility for Unmanned Aerial Vehicles (Drones). These weapons, flown by pilots sitting at consoles in Nevada and New Mexico, kill hundreds of civilians in Afghanistan and Pakistan and devastate communities. We the citizen/taxpayers of Maine will be asked to pay to facilitate this technology. We do not want our community involved in this “hands off” way of expanding the war. People all over the state are worried about this possibility. Please send a check to the address below and include your name, address, town, phone number and e-mail address. If you cannot afford $20, send what you can. Come to the Common Ground Fair this weekend and pick up more literature on drones and their role in the war in Afghanistan and Pakistan. Sponsored by Greater Brunswick PeaceWorks, PO Box 652, Brunswick, ME 04011, Christine DeTroy, treasurer. The top U.S. and NATO commander in Afghanistan warns in an urgent, confidential assessment of the war that he needs more forces within the next year and bluntly states that without them, the eight-year conflict "will likely result in failure," according to a copy of the 66-page document obtained by The Washington Post. 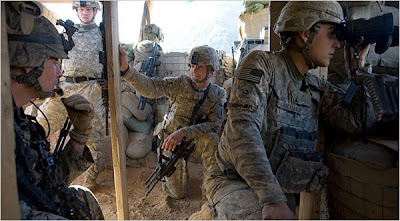 Gen. Stanley A. McChrystal says emphatically: "Failure to gain the initiative and reverse insurgent momentum in the near-term (next 12 months) -- while Afghan security capacity matures -- risks an outcome where defeating the insurgency is no longer possible." Obama does not seem to know what he wants to do. Media reports maintain that he is undertaking an extensive review of Afghanistan. Previously it was thought that Obama had agreed with Gen. McChrystal's "counterinsurgency strategy" but now key members of his own Democratic party are publicly warning that their patience on Afghanistan is running out. The president is thus beginning a "logic chain" review of the current war plan. Public support for Obama's "good war" is in free-fall as up to 57% of the American people now oppose this eight-year mess. In another article in the Washington Post this morning they report: But Obama's deliberative pace -- he has held only one meeting of his top national security advisers to discuss McChrystal's report so far -- is a source of growing consternation within the military. "Either accept the assessment or correct it, or let's have a discussion," one Pentagon official said. "Will you read it and tell us what you think?" Within the military, this official said, "there is a frustration. A significant frustration. A serious frustration." This is the right time for anti-war activists to be stepping on the gas. This is one time when public pressure can bear serious fruit. Obama does not want to end this occupation. He does not want to anger the Pentagon. He is a people pleaser. The massive US military base building now underway in Afghanistan indicates to anyone paying attention the true US intensions. But the Democrats, already in trouble with their "base" of voters for failing to deliver on real health care change, cannot afford to have the peace movement on their backs in the 2010 Congressional elections. So they are in a position now where they must begin sounding like they have serious doubts about Afghanistan in order to cool down the public concern. But if we have learned anything in recent years it is that there is a very long distance between Democrats talking a good game and delivering on their big talk. Now is not the time for the peace movement to take the steaming kettle off the hot stove.